Compare prices from multiple car hire suppliers in Cascais to find the best available deal. A few of the car rental companies we compare include Gold Car, Budget, Avis, Hertz, Sixt and many more. Cascais is a beautiful coastal down located in the Lisboa region of Portugal. It is only 30 kilometers outside of Lisbon and houses around 35,000 inhabitants. It is a very cosmopolitan location and one of the richest municipalities in the country. It gained fame status as it was the resort of the royal family of Portugal during the nineteenth century and early twentieth century. Today, it is a very popular destination for Portuguese as well as foreign tourists. The city boasts a large yacht harbor and a number of small, sandy beaches, including Guincho Beach. The beaches are perfect for sailing, surfing, wind surfing, as well as kitesurging. There are more than ten golf courses in the city. Cascais also houses the Estoril Casino, which is one of the biggest casinos in Europe. 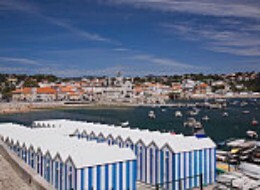 The Museo do mar showcases the early story of Cascais as a fishing village. There is also the very attractive Parque Palmela. The city of Cascais is serviced by the Lisbon Portela Airport (LIS), and it is located 25.97 kilometers from the city.